Newtown came away from Copenhagen with pride intact but still face a two-goal deficit in the second leg of their Europa League second qualifying round. 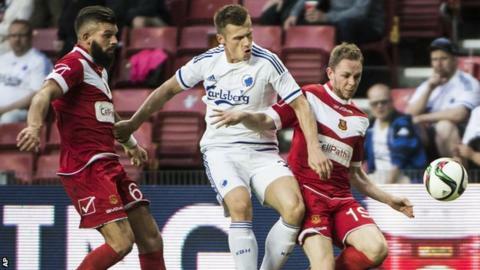 The Welsh Premier League side got off to the worst possible start at the Parken Stadium, when Ben Verbic struck for the hosts after three minutes. But Newtown refused to crumble and it took until the 74th minute for Kasper Kusk to double Copenhagen's lead. The second leg at Latham Park is on 23 July. "I thought the players were tremendous tonight," said Newtown manager Chris Hughes. "We'd worked hard on the game plan, myself and the coaching staff with the players, and we knew how Copenhagen would play, we knew they'd have lots of possession and we set up fantastically well to cope with that. "The pleasing thing for me was the last 10 to 15 minutes the fitness levels were really good; for a part-time side to come up against a very, very good full-time team and keep going the way they did they boys can be very proud." Hughes's side overcame full-time Maltese club Valletta 4-2 on aggregate in the first qualifying round.